Osteoporosis should be suspected in any person who has a fracture. X-rays will usually confirm a fracture if there is one. X-rays should be done if a limb or other bone is acutely painful after a fall or injury. Sometimes a person will have mild to severe chronic back pain, and X-rays of the thoracic or lumbar spine might detect a wedge or crush fracture (see Figure 1). Any person with a significant fracture needs to be assessed to exclude or identify medical problems that could have played a role in the resulting fracture. A person who has not had any fractures but does have a number of risk factors for osteoporosis needs an examination called a bone mineral density test to determine if osteoporosis is present. Some of these risk factors include being over 65 years old, long-term use of corticosteroids or other high-risk medication, premature menopause, and presence of medical conditions associated with bone loss. 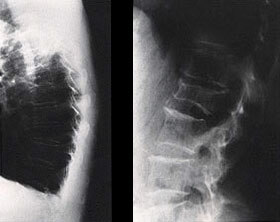 A lateral X-ray of the thoracic spine (left) might reveal small wedge fractures, or of a lumbar spine (right) might reveal a more significant crush fracture. A bone mineral density (BMD) test determines the bone mineral (mainly calcium) content of certain bones. It is a simple, painless procedure that can measure the mineral content of bones in specific body areas, including the spine, hip, forearm, or whole body. Several types of bone density tests are available depending on the specific body areas. For example, dual X-ray absorptiometry (DXA) is preferred when assessing the BMD of the spine and hip, while ultrasound is preferred when assessing the BMD of the heel. The BMD tests are used to assess bone mass and fracture risk and to monitor response to treatment. 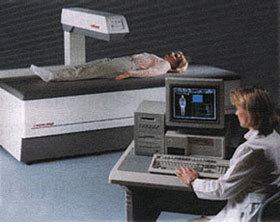 For the DXA bone density test, for example (see Figure 2), the individual lies perfectly still on a special table while a mechanical arm passes over the body. The mechanical arm sends an X-ray beam through the bones being scanned. A detector arm below the body determines how much of the X-ray beam passes through the body and, from that measurement, calculates how much bone is present. That calculation is then compared with the result of an average young adult. Your doctor will discuss the results of the bone density test and help you make a decision about treatment options. A common bone density test can be done quickly and in comfort. A common bone density test can be done quickly and in comfort. The radiation risk is minimal – a single bone density test gives about one-tenth as much radiation as a chest X-ray. This is the same radiation exposure as you receive flying from the east coast to the west coast of North America. Nevertheless, a woman should not have a test if she is pregnant. It might be recommended to repeat a bone density test to make sure there is no further bone loss over time or to help evaluate if the treatment is effective. Generally, a repeat bone density in 3 to 10 may be recommended for people not on medication for osteoporosis. Very occasionally, a bone density after 6 months to 1 year is helpful if it is suspected that the bone loss is very rapid. Bone density (T-score) and age can be used to predict fracture risk. A T-score gives you a good idea of how strong your bones are now compared with what they were at their strongest. It does this by comparing current bone density with peak bone density. A T-score of greater or equal to -1 is considered normal. Osteoporosis is diagnosed if T-score is lower than -2.5.
Who should get assessed for osteoporosis and risk of fracture? If you are over age 50, you should be assessed for risk factors for osteoporosis and fracture risk. Clinical risk factors for fracture include family history, smoking status, low body weight, rheumatoid arthritis, long-term use of corticosteroids, vertebral compression fractures, and high alcohol intake. Younger adults (less than 50 years old) should be assessed if risk factors such as malabsorption syndrome, hypogonadism, premature menopause, or hyperparathyroidism are present. Younger adults may also be assessed if they’ve had a fragility fracture (a fracture caused by an injury that would not fracture a normal bone – for example, falling from standing height). How do you interpret the results of a bone density test? Your doctor will explain the results. Often, the result of the test is reported as a T-score. A T-score is a measure of your current bone density compared with what the density theoretically was at its peak (see Figure 3).